Why isn't the word "drugs" not banned for nicknaming Pokemon in ORAS and XY? I know this picture is quit funny.But I was quit surprise to the word drugs in it. Isn't drugs is censored/bad/disturbing word. So I was wondering game freek did not ban this word. I dunno. But, my moveset for drugs would be Acid, Frenzy Plant, Grass Whisle, and Forests Curse. This answer would have made an excellent comment. It is actually quite funny, albeit unnecessary. I do hope it is converted to a comment before it reaches 420 down votes, though. Drugs need not necessarily be bad. They might be medicines too. Drugs as such are not 'bad' or 'derogatory'. Most banned nicknames involve racial or gender-based discrimination. They also include crude language. It is not possible to ban every word that can be bad in one way or the other; there are far too many of those. On the whole, "drugs" do not fit into any category, and therefore, it is not necessary to ban it. Besides, if they did, people would find another to bypass. > "Life, uh, it seems, finds a way." Why is hirohito not a banned nickname if hitler and mussolini were? Why is the nickname "England" banned in X and Y? 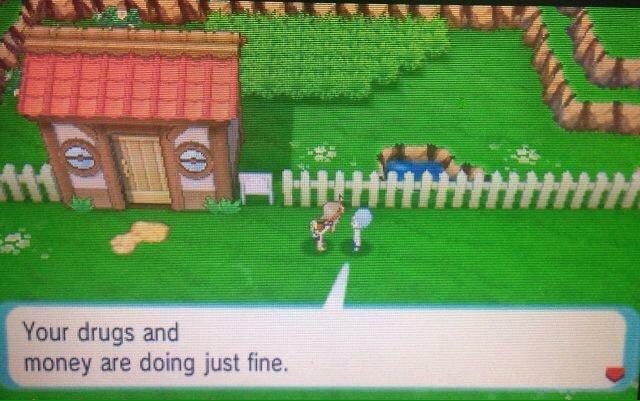 Is there a list of banned words in Pokemon X and Y? Where is the name rater in Pokemon oras?